All of our itineraries are listed on our Web site -- see pictures of the lodges and animals and catch up on past newsletters. that the Nile Crocodile has between 64 and 68 cone shaped teeth, which are constantly being replaced as they get lost or damaged? 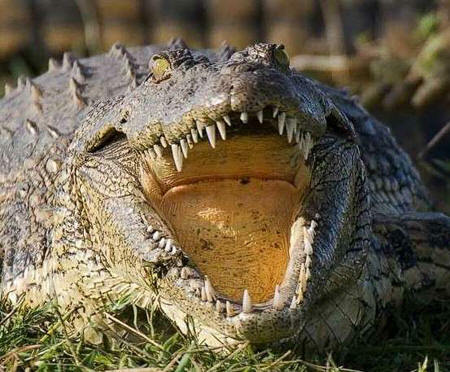 An individual tooth lasts for about 2 years and a single crocodile might go through over 2000 teeth in its lifetime. The meerkat's courage is outstanding - the meerkat's at Jack's & San's Camp continue to thrive with a new litter of pups. They are extremely active, forever wrestling, foraging and mimicking mom & dad as the make the transition into adulthood. 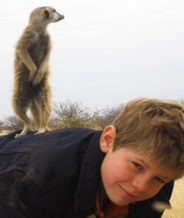 There courage is outstanding, surprising everyone with their nonchalance and disregard by foraging at the feet of the guests, or even taking advantage of a shoulder or knee as a sentry post. Traditional Folklore .... The Baobab Tree - Baobab trees, so stark, have a moment of glory as they flower, the African legend states that he who picks a flower of the Baobab shall be devoured by a lion. But one can't stop thinking "how do you even get to the flowers that are 20 feet off the ground?" It's summer time in Africa, and all the animals have new born babies. 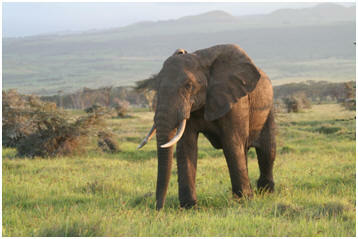 The game viewing is spectacular and is a perfect backdrop for the glorious sunsets and scenery. In this newsletter we catch up with all the happening in Africa! Hippos protect their hairless skin from the sun. They actually sweat a sunscreen similar to commercial products used by humans. The colorless, viscous liquid, which also acts as an anti biotic, gradually turns red and then brown creating a plastic-like structure to protect the animal as it enjoys day long baths and helps heal wounds inflicted by other hippos during fights for territory. Scientists have carried out tests on the substance and found that it turns extremely acidic, working as a strong antiseptic to help heal open wounds, not only that it absorbs light, particularly ultra violet rays. There is one drawback though, apparently it really smells very unpleasant! A rhinoceros beetle can support up to 850 times its own weight on its back. That would be the equivalent of a man carrying 76 family-sized cars around on his back. The Sand Grouse soak their absorbent belly feathers in water, then fly back to their chicks - sometimes up to 60km away - who carefully strip the water from the individual feathers. The call of a leopard, given both whilst inhaling and exhaling, sounds a lot like someone sawing wood. Although looking rather slow-motioned, the Giraffe can actually reach speeds of between 30 - 35 miles. Wild Dog are one of the most successful hunters in Southern Africa, killing 85 per cent of all prey pursued. > Londolozi - South Africa; new frontiers in eco-friendly technology. > Mwea School/Fund - Kenya. > Say more than "I Love You" this Valentine's Day. > Sanctuary Stanley's Camp Upgrades. > Savute Channel flows past Savute Safari Lodge for the first time in 30 years. > Robin Pope Safaris Photo Awards & 2010 Photographic Safaris. > Luwanga Forever - A chance to support the community work of Norman Carr Safaris and make a real difference to the lives of the people and wildlife of the South Luangwa. > Singita - Making a difference. > Pezula Castle on the beach. > Camp Jabulani - Zindoga Family Villa. > Governors' Camp Launches Big Cat Updates. > Saruni Camp in the Masai Mara has a new Family Tent at their Campi Ya Tembo Camp. > Little Kulala by the numbers!. > The Desert Elephants of Kaokland (Today Kunene District, north-west Namibia). > Conde Nast 2010 Hot List. > Conde Nast 2010 Hot Spas. > Conde Nast 2010 Hot Tables.